Welcome to the Robinson's Cove Villas, located along a small private beach in the heart of the splendid island of Moorea, 30 minutes away from Tahiti. Houses are rare in the neighborhood, and untouched nature is everywhere waiting for you. Our beach Villas are in an exceptional site, right by the lagoon in Opunohu bay (the most beautiful bay in all Polynesia according to yachtsmen! ), surrounded by breathtaking peaks and by a luxurious nature famous for its untouched and original beauty. It is in this surrounding that historical films about Polynesia are regularly shot (Namely 'The Bounty' in 1984 with Mel Gibson, etc). The largest private yachts anchor frequently not far from the Villa, as 'Robinson's Cove' offers complete tranquility and an excellent shelter, it did for Captain James Cook who discovered the bay and was the first to moor there in 1777; nothing has changed since that time! Car:: Car: Mini van TOYOTA (A/C, 7 seats) is available or FORD Sedan (A/C, 5 seats), under a rent and drive package. Please ask for conditions and details by email. Snorkeling / Diving / Lagoon:: Snorkeling: The beach in front of the villas is on a small undewater plateau where you can walk for about 20 meters (60 ft). Then there is a drop off 25 meters (80 ft) deep. This drop off, home of many sea species, lets you snorkel in full safety among the fish only a few dozen yards from the Villas. There are no big waves on our beach, because we are protected in the bay, so this is excellent for kids and for snorkeling! Diving: There are many scuba diving centers in Moorea, Alix our caretaker will help you. Moorea is famous for his diving spots. Excursions on the Lagoon: Whether a simple ride to discover the lagoon or an encounter with whales and dolphins, or waterskiing at sunset, many service providers can pick you up by boat directly at our Villas. Power Boats: It is possible to rent small power boats with or without a license, for one or several days. Activities with our partners:: Horseback Riding: There is a ranch not far (about 10 minutes by car) in the Opunohu Valley for memorable rides in spectacular scenery made of peaks and lagoons. 4x4 and Quad bike: For those who prefer the comfort of a motor vehicle, a discovery of the hidden paths and breathtaking peaks can be done in a Jeep or in Quad ATV motorcycle. Hiking: On the mountainside or throughout the tropical jungle, there is nothing like hiking, but it is safer to hire a guide! Marathon: Marathons, triathlons, etc. are regularly organized by the Te Moorea Sports Association. Golf: The new Moorea Golf Course is 15 minutes drive away, near the airport. Spa : Several Spas are located in Moorea Island, including Helen'Spa, who created the first Tahitian Spa in 1999, ranked among the most beautiful spas in the world. We bought this property in 2005, and after much enhancement, turned it into a Vacation Rental 2 years later. Robinson's Cove Villas was born. In 2010 we added two new authentic wooden Villas in the grounds next door. We hope to welcome you in our paradise, in the stunning and unique Opunohu bay, Moorea Island. Our beach Villas are located in an exceptional site in Moorea Island, right by the lagoon in Opunohu bay (the most beautiful bay in all Polynesia according to yachtsmen! ), surrounded by breathtaking peaks and by a luxurious nature famous for its untouched and original beauty. Houses are rare in the neighborhood, and untouched nature is everywhere waiting for you. It is in this surrounding that historical films about Polynesia are regularly shot (Namely 'The Bounty' in 1984 with Mel Gibson, etc). The largest private yachts anchor frequently not far from the Villa, as 'Robinson's Cove' offers complete tranquility and an excellent shelter, it did for Captain James Cook who discovered the bay and was the first to moor there in 1777; nothing has changed since that time! We have a concierge living in our grounds in her own bungalow, she will be able to help you for any leisure activity or outing you might wish during your stay. 2 brand new bathrooms, including semi-outdoor with direct beach access. The white sand beach beach is private. for island calls. People can also call you from abroad. WiFi 802.11 b/g standard. Connection is only 300Kb/s, which is a lot for Moorea (!) but fine for emails. Refrigerator / Freezer, Washer, Dryer, Stove and Oven, Micro-wave, etc. The Villa features - 2 air conditioned double bedrooms , one of which opening directly on the beach, - 2 bathrooms with spatious showers, - 1 large living room (40 m2, 430 sqft), 1 equipped kitchen, 1 office, - 1 mezzanine with 1 double bed + 2 individual beds. The deck: all the bay windows open on a large wooden deck surrounding the villa with a dining area and an outside living room, facing the beach. Spent a week at the Villa. The view and location is very nice the manager is very helpful. I rented a car from the owner a must and reasonable price. The house is well furnished and kitchen well supplied for cooking. Only a/c in bedrooms so can get warm inside but good for sleeping. The snorkeling right off the beach was great a lot of reef fish and coral. Overhaul the property is great and private with a fantastic view to enjoy and good outdoor seating. Thank you for your review. Glad you enjoyed our property in Robinson's Cove Moorea and the service from our Concierge living on site. Being by the lagoon is a very special treat indeed, it feels at times just like being in front of a lake, with the majestuous mountains of Opunohu bay surrounding you. Hope you will return and enjoy all this again! Kind regards, Denis. First let me say the location and views from the Villa are spectacular.There were a couple of items I think would improve the overall stay there. The furniture is adequate in the living area but could be more comfortable. The mini split AC is only located in the downstairs master bedroom which made the rest of the house very uncomfortable as there was a lack of breeze to flow through the house. It would be most beneficial if a ceiling fan was placed in the living room downstairs and another AC mini split for the upstairs sleeping area as it was extremely hot and humid upstairs for sleeping conditions. The kitchen well supplied. The bathroom and shower areas were wonderful and it was convenient to have a washer and dryer in the unit. Wonderful private beach and many toys to keep everyone entertained. The property manager, Alex, is extremely friendly and helpful. A wonderful addition to the property. Denis, the owner was extremely easy to work with and very cooperative. He called me immediately whenever I had a question regarding the property prior to our arrival. Villa Cook was everything we were promised. Sitting on the water's edge it was a peaceful haven. Lots of light and tasteful furnishing. The 2 bedrooms had well working air conditioners, although rarely needed since it cooled down to the mid seventies during the night. Well equipped kitchen with starter supplies of coffee, sugar, spices, etc. Even a bottle of lovely sparkling wine awaited us upon arrival. Alix was very helpful whenever we had a question. Snorkeling right in front of the house was wonderful! I hope we can return one day..
Just returned from our Tahiti trip where we spent our first week in the Villa Cook. I was very impressed with the accommodations and all the extra curricular opportunities right at the property. All kinds of things were provided, kayak, life jackets, snorkel gear (although we had our own) and the fishing tackle was even put to use. Just a stick, fishing line and a hook were all that was needed for my friend's 10 year old to catch (and release) fish just feet from the deck steps. Alix and her kids were a delight. The four legged kids hung out with us all week and we all enjoyed their antics.. Thank you for sharing this paradise with us Denis, our trip was all that we hoped it would be and I hope to be back someday. Best New Year's ever! Thank you for your review :). It looks you enjoyed this beach Villa as if it was your own beach Home... and this is our best reward! Good idea also to have rented the additional bungalow for the 3rd couple. You are welcome back anytime! Kind regards. Denis, owner, & Alix concierge on site. My husband & I recently returned from a stay at Robinson’s Cover (Villa Wallis). This was a BIG trip for us and we did endless research trying to pick the best place and I can say that Villa Wallis was exactly what we had hoped! The location and view (in every direction) is like stepping into a post card! The Villa was exactly as advertised and I must admit, that if anything, the pictures do not truly do justice to the place. The lanai is amazing. The view from the bedroom is stunning. The beach is excellent for sunning. The snorkeling is great with shallows and a reef wall just off shore. While there we saw a pod of 10 dolphins. The location is ideal and with a car most everything is 5 – 20 minutes away. We took advantage of the boat rental and had a wonderful day touring around the bay and lagoon. Denis (The Owner) was extremely helpful and quick to offer suggestions on activities in Moorea or elsewhere in French Polynesia. Alix (The onsite Manager), as I had read in earlier reviews, was wonderful and was quick to offer any assistance and routinely asked if we needed anything. Pepsi (The Dog) was the icing on the cake and always a welcome, discreet, and well behaved visitor. We will dream of a return visit until that dream is attained! My wife and I stayed at Villa Wallis in May 2013 for our honeymoon. Choosing to start our honeymoon at Villa Wallis was a huge mistake. The owner advertises Villa Wallis as having A/C, so we reserved that villa. When we showed up, however, the A/C was broken and every single window and door in the bungalow had been left wide open "to let the breeze in," which also let in swarms of mosquitoes. Although my wife and I applied copious amounts of mosquito repellant, and constantly burned citronella candles, we couldn't escape from the bugs that had been let in. We aimed the fan directly at the bed at night, but because the owner doesn't provide a mosquito net, we were literally eaten alive while we slept. In my four nights at Villa Wallis I got over 100 mosquito bites on my legs. In addition to the mosquito problem, I woke up the first night to the sounds of a feral cat hissing and scratching against the inside hall door - apparently the cat got in when all of the doors had been left open before we arrived and spent the entire day/night inside. There is also an animal living above and behind the master bed in the walls - we heard it every night running around and eating right behind our heads as we tried to sleep. The owner could not have been any less accommodating after we informed him of our experience. I sent pictures of my bug bites to the owner, but instead of offering to provide some sort of accommodation for his failure to provide A/C as advertised, he condescendingly stated that I must never have traveled in the tropics before. In fact, I have traveled extensively in the tropics and have never experienced anything as bad as being INSIDE Villa Wallis. After our initial communication, the owner completely failed to respond to our follow-up inquiries regarding our stay. The owner's failure to provide the A/C we paid for significantly affected the rest of our trip even after we left, as I was incredibly uncomfortable with hundreds of mosquito bites on my body for the entire honeymoon. I did not get a single noticeable bite while staying at any other location throughout French Polynesia. My wife and I will definitely return to French Polynesia, but we will stay far away from Robinson's Cove. Be careful where you choose to stay for your special trip to French Polynesia. The LAWYER, the ONE-NIGHT without A/C, and the FERAL CAT! Rather than long words, let me post the answer I sent at the time to this guest, a young lawyer from LA, who indeed suffered 24 hours of broken A/C (and this lasted 24 HOURS ONLY). Sorry about this. Somme people are indeed more sensitive to mosquitos than others. Also there were 2 mosquito nets on the beds in the mezzanine of this Villa for use if need be. BTW, there are no feral cats in French Polynesia :). It was our caretaker's cat named Victoria. The former A/C in Villa Wallis broke 3 days before your arrival, and when we decided to buy a new one rather than repair the old one it was a Friday. As you have now realized Moorea is a VERY SMALL tropical island and everything is in fact shipped from Tahiti. We managed to get a brand new DAIKIN A/C when suppliers opened again on Monday (the day you arrived), shipped it and installed it on Tuesday noon. Sorry about the trouble for the Monday night when you had no A/C indeed. It worked fine for the rest of your stay. Concerning mosquitos, I expect you did not travel much in the tropics (I don't talk about your trips to FLA or south America which aren’t located in the tropics anyway) because indeed there can be many bugs in French Polynesia, especially because this year there has been raining a lot in April, hence why we smoked the whole place just before you arrived. We rented you this beach house for 4 nights, even though as mentioned on our web site we only rent for a minimum of 5 nights, we gave you our automatic car Sedan with no extra cost when we discovered you were not able to drive a manual gearbox car, and we offered you, beside a bottle of Champagne, a free welcome gift for a small black pearl with a certificate of authenticity. I hope you enjoyed all of them. The magic island of Moorea, Tahiti's little sister, has become a hot spot of tourism in Polynesia. 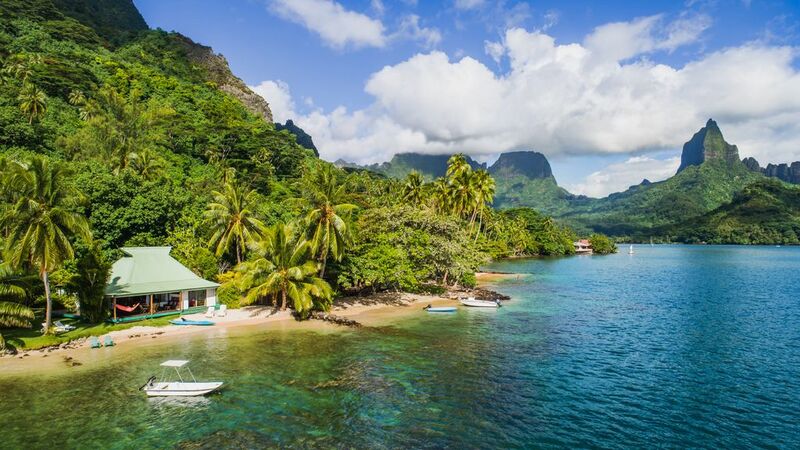 With its diversified hotel infrastructure, Moorea possesses all the assets to display its charm and originality: breathtaking and accessible beaches, mysterious and strangely-shaped mountains, scores of nautical activities and unforgettable excursions. Its inhabitants are totally dedicated to offering you a traditional welcome the way ancient Polynesian did. They will help you discover their magnificent island. Only 7 minutes away by plane (or 25m by ferry) from Tahiti, the landscape difference is striking. As you leave behind Papeete's traffic jam, come and immerse yourself in the ever present nature. All around the island (about 60km or 37 miles) the many white sand beaches offer visitors a whole range of beautiful underwater scenery. Even in the shallowest waters, you can admire the amazing fauna and flora of our Polynesian lagoons. Damage deposit : Pre-authorization for damage deposit for 700 Euros to accept via credit card 30 days before arrival, not debited unless damages.